The winners of Hearken’s Champions of Curiosity awards show what’s possible when stations invite listeners into the editorial process. Each year, Hearken recognizes the stories and newsrooms that are setting the bar for what great audience engagement journalism can (and should) look like. Considering that Hearken partner newsrooms published more than 1,700 public-powered stories in the past year (Nov. 1, 2017 – Oct. 31, 2018), these winners are truly the cream of the crop. Our outside judges — Rob Golub, John Ketchum, Jan Ross Piedad, Sherry Skalko and Lam Thuy Vo — tackled judging several key categories. 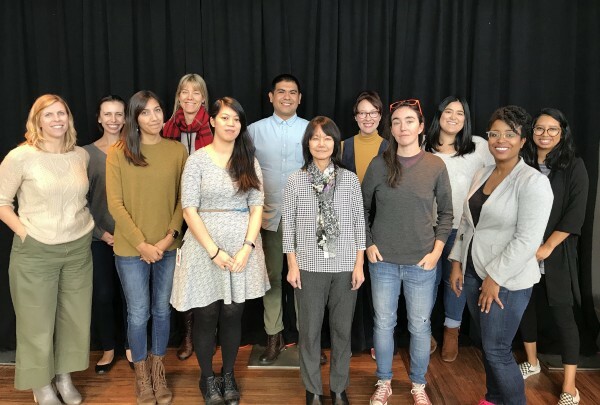 Hearken’s newsroom partners voted for winners in two categories, and the other categories were judged by Hearken’s engagement consulting team. Given to the newsroom that best puts into practice a system of hearing and responding to their audience’s curiosities. Public-powered journalism pros. Quantity of questions answered is one factor considered. KPCC in Southern California first started working with Hearken in the spring of 2017. In its first year, the public radio station launched #SoCalSoCurious to gather general curiosities about the region, and planned live events around the input they got through Hearken. Since then, they’ve expanded in their use of Hearken’s public-powered principles, deepening and spreading the model across their work on- and offline. The scope and creativity of their engagement efforts has been an inspiration. They’re fueling beat coverage, breaking news, and live events, and connecting Hearken with their overall engagement strategy, which also includes utilizing GroundSource and the Public Insight Network. Director of Engagement Ashley Alvarado shared on Twitter that in 2018 to date, the newsroom has received more than 1,600 questions with Hearken. Growth: This summer, KPCC reported that they’d “revived beloved local publication LAist with the help of more than 1,000 individuals” who contributed to a Kickstarter for the cause. Not only did this move add more reporters, but it also connected KPCC to an expanded community of LA residents. #SoCalSoCurious’s spirit continues through a regular LAist column, Ask Us Anything. Election: Ahead of this year’s midterms they continued their successful Human Voter Guide series. (The human is political correspondent Mary Plummer and other helpers.) The team jokes that the idea behind the series is to make accessing information about how to vote as easy as calling up the Butterball Turkey hotline. They invited Californian voters to ask all their questions ahead of Election Day, and the audience FAQs are all nicely organized by topic, from general info to vote-by-mail ballots to registration. Because of the trust that the Human Voter Guide built up through these efforts, their journalists received several tips on a local election day in June that people were having trouble voting because their names weren’t on the rolls, and they were among the first to confirm and report that 100,000 names had been left off Los Angeles County voter rosters, hours before the county officially acknowledged the error. Breaking news: As news breaks and crises unfold, KPCC has worked to consistently invite audience questions and to provide useful, targeted information in response to pressing information needs. After the Thousand Oaks mass shooting, they provided a roundup of information on how to help and how to cope. They invited and received more than 100 questions in one week about the wildfires during the worst year on record, 2017. Alvarado and environment reporter Emily Guerin looked at every single question and responded in some way, either publicly and/or via email. They fielded everything from the origin of fires’ names to how to find out about evacuations in one’s area. They won a Regional Murrow Award for excellence in innovation for that coverage. As a new crop of wildfires has devastated the state this year, they’ve continued that important work, collecting more questions and resurfacing past reporting to be helpful to new affected communities. Events: KPCC held many in-person events with aims to connect with new communities in person and to respond to surfaced curiosities and concerns. In January, they hosted a gubernatorial town hall in collaboration with USC and others, and collected more than 1,100 questions from community members (mostly non-listeners) that shaped not only the town hall, but their ongoing coverage. For another event, dozens of people submitted and voted on questions about the homelessness crisis in Los Angeles. Throughout it all, KPCC has kept its focus on how it can best serve and listen to its audience (and the various communities that compose its audience). The newsroom has even grander ambitions for how much public-powered journalism they’ll produce in 2019. Winner: Courtney Marshall, NHPR, You Asked, We Answered: Where Can a Black Woman Get Her Hair Done in New Hampshire? The story addressed both the larger context of the problem (talking with other black women and experts in the history of black hair), as well as the question-asker’s individual need to find a hairstylist by visiting two salons with the NHPR reporter. The question-asker and reporter chatted with the staff at each salon — in more of a conversation than a traditional interview — which was especially important with this story because the question-asker had more relevant questions to ask the salons about knowing how to cut and style black hair. The question-asker had already contacted the township in Rijswijk in the Netherlands regarding the mistake (just the absence of one letter completely altered the meaning of the word), but she never received an answer so she reached out to Omroep West for help. The question-asker was very involved in the reporting of the story, and was able to personally replace the sign with the counselor of the township. Honorable Mention: Margaret Peeples, WFAE, FAQ City: Why Did CMPD Destroy 1,000 Sexual Assault Kits? A 68-year-old listener asked the station about a 2016 report that the police department had destroyed 1,000 sexual assault kits. She wanted to understand the reasoning behind the action. Despite the serious topic matter, the listener stayed involved throughout the process. Selected from finalists by external judges. Ahead of the May election, WFAE in Charlotte, North Carolina looked into the 287(g) program, a voluntary partnership between the county sheriff’s department and Immigration and Customs Enforcement, where the sheriff’s office could inform ICE of inmates that are living in the country illegally. A listener asked how many people detained through this controversial program committed serious crimes such as murder. The 27-page single-spaced report the station received through a public records request showed that in the previous year a little over one-third of those detained faced felony charges. The most common crime was driving while intoxicated. The 287(g) program was cited by news outlets as a major factor in the sheriff’s election loss. Judges gave this piece high marks for exemplifying the public-powered reporting model, and called out its impact. Reporters followed parents through the complicated, stressful lottery system used to assign students to public schools in San Francisco. After the initial report, which included admissions data that had never been released to the media before, school board members introduced a resolution to end the system. A school board representative said the reporting was part of what pushed them to take that step. KPCC’s commitment to serving its audience through the December 2017 wildfires in Southern California stood out to us and the judges. The station started collecting questions, and then answered them on-air and online, and sometimes even directly over email. The online presentation included 24 questions, and was organized by topic for ease of use for the audience. In some cases, staff included links to other resources or embedded maps from other organizations to make sure people could find the information they needed as quickly as possible. Our judges appreciated the clarity of presentation and public-powered process. This category’s winners were voted on by a collection of journalists in Hearken partner newsrooms. In response to a listener question about an epidemic of car break-ins, KQED reporter Sarah Craig strapped into a bulletproof vest to ride along with a police sergeant. When they hear scanner traffic about a break-in happening, they turn around fast, dodging traffic and an oncoming cable car. Craig sees police huddled around the suspects, who stole two Coach purses. Craig also asked a former car thief how he would break into her own car, and gets his tips for how to protect your car. He laughed when recalling how he got caught twice in two days for selling drugs, which is when he decided to stop being a criminal. “I couldn’t help but laugh at how much he was laughing about it, but really, I was shocked. I couldn’t believe he got caught for selling drugs, but never for stealing cars,” Craig says in the piece. This is one of those questions where the more you think about it, the more follow-up questions you have. The result of pulling that thread was a touching story about caring for zoo animals and the incredible lengths these professionals go through to properly evaluate animals when they die. Dr. David Porta at Bellarmine University told WFPL “when they pass away, their bodies are still teaching us.” The nomination for this story also carries a warning: “if there were a grossness award, this would win for the baby pool bit.” That’s around the 4:40 mark, if you’re squeamish. 18-year-old Terrance Robinson, 14-year-old Victor Barnett Jr., 17-year-old Darius Simmons and 16-year-old Ashanti Travers posed that question to WUWM’s Bubbler Talk series. Reporter Latoya Dennis moderated a frank discussion between the teenagers and news directors from local outlets. The managers opened up about how they approach stories and the problems within their own newsrooms, and the teenagers were honest about their frustrations with local media. Question-asker Kate Hannigan turned to WBEZ’s Curious City to find out why she doesn’t see many statues of women in Chicago’s parks and streets. The Curious City team turned to their audience to nominate women who should get statues. WUWM’s roundtable discussion on why local media covers young black men the way they do wins this category for much the same reason it won most transparent process. The journalists turned the microphone back on themselves, and were open and introspective about the role they’ve served and how things might change. In order for the news industry to gain trust in communities they may have harmed in the past, it helps for newsrooms to be transparent about that history, to acknowledge the harm done, and to share the measurable potential steps they can take to improve. A random kangaroo crossing sign once stood in Clintonville, a neighborhood of Columbus, Ohio. Residents had different, inconclusive theories about why it existed. Gabe Rosenberg of WOSU’s Curious Cbus went to track down its origins. In a surprising turn of events, Gabe’s poking around tipped off the city that it had no permits to be there, and it got taken down. The community backlash was swift. WOSU owned up to it. The community forgave. Then, they mounted a full-on grassroots campaign to pressure the city to reinstate the sign, with stickers, yard signs and coffee blends dedicated to the fallen kangaroo. It was successful, and now stands at a local school. Gabe said that first story about the Kangaroo Crossing sign went about as viral as possible. At the time, it became WOSU’s top story of 2018 (now it’s #6, thanks to some other impressive stories). It also had a huge splash outside of the newsroom — WOSU was the only outlet to cover this story when it first happened, because it was prompted by questions from their own audience. But the story quickly appeared in the local newspaper multiple times, on TV stations, and elsewhere on the internet. It garnered a mention on the NPR’s Morning Edition program, which gave WOSU “kudos for doing your job.” The story also prompted a feature on 99 Percent Invisible, a podcast/website all about design, which saw the story as a tale about guerrilla art and the relationship of local governments to their citizens. Nashville Public Radio debuted one of their biggest Curious Nashville stories of the year with a live stage performance that was accompanied by puppetry with props and illustrations at its second annual Podcast Party performance at the Nashville Children’s Theater in August. Reporter Tony Gonzalez collaborated with a local group of puppeteers to produce a live animated version of his radio story answering a question from WPLN listener Kelsey Bridges about a large peace sign “carved out of a wooded area near the airport” that is only visible by aerial view. Thanks to several weeks of planning, the puppeteers created various illustrations and elaborate sets / dioramas that they manipulated in real-time on stage as the audio story played for the audience. The visuals were projected onto a large screen for everyone to see, and the resulting 12-minute video of the performance represented a new level of coordination between WPLN and visual storytellers. WBEZ has been exploring one audience question and using it as a jumping off point for convening a broader community in person to talk through an issue that affects them. A Chicago ESL teacher asked “Do Chicago’s Arab And African-American Muslims Share Mosques? If Not, Why Not?” When that question won a voting round, WBEZ brought four Muslim leaders from the Arab and African-American communities in Chicago together to talk about their relationship, why it’s been divided, and how it’s changing with President Donald Trump in the White House. But it didn’t stop there: the guests suggested to Curious City that they delve into the topic further, in a forum where more people could attend and hear a conversation. So, Curious City worked with the guests to plan a panel in partnership with the American Islamic College (AIC) in November 2017, bringing together a diverse group to talk through racial divisions in the community. The Q&A at the panel got heated, as people spoke from personal experience and hurt. It seemed that people wanted to continue the conversation and work toward solutions. So this fall, WBEZ decided to keep that momentum going in a forum that would allow for people to collaborate around solutions. They hosted an interactive workshop on building interracial relationships within the Chicago-area Muslim community with the same partner, the AIC. All of this was sparked by one audience question that went on to be so much more, and Curious City was willing to maintain that momentum. They took cues from their guests, leaders in their community, to help the community delve deeper into a contentious issue. Curious City took on the role of a convener with these events. That’s above and beyond what newsrooms may typically take on, but serves as a compelling potential direction for them to go as they work to deepen engagement and provide value for a range of communities. Cruise tickets each year have been $125 a pop. Local news nerds have paid it to get onboard and mingle with their favorite local reporters and fellow fans. Not a bad idea for a revenue stream (pun intended)! Marfa Public Radio launched their Hearken-powered series West Texas Wonders this summer. As part of the launch, general manager Elise Pepple and reporter Sally Beauvais went on a week-long road trip through West Texas to meet listeners and solicit questions in-person. More than 200 questions were submitted through the road trip. When The Evergrey was brainstorming it’s first Hearken project last summer, cofounder and director Mónica Guzmán knew that she wanted to focus their efforts on homelessness, a huge, critical issue in Seattle with a lot of untapped curiosities, concerns, and anxieties — both comfortable and uncomfortable. So Guzmán started reaching out to local media outlets with the hope of bringing on a partner or two, and she ended up forming a coalition of eight local news organizations that would put out the same call for questions about homelessness in Seattle and then shared all of the data they collected: The Evergrey, GeekWire, Crosscut, KUOW, ParentMap, Seattlepi, Seattle Patch, and Real Change Seattle. After a lot of list and voting embeds, Google Docs and spreadsheets, scheduling decisions, collaborative editorial calls and some ambitious project management from The Evergrey (the only outlet of the eight with access to Hearken’s Engagement Management System), the project resulted in 400 reader questions, 10 stories reported by eight outlets that answered the most popular and interesting questions, and a popular Facebook Live broadcast where several of the partner journalists discussed what everyone in the city could learn from the questions they received. “We are incredibly proud of this project, and in particular, the collaborative energy it channeled from curious Seattleites — including folks from the homeless community — and caring, hard-working journalists who want to serve them,” Guzmán wrote about the collaboration. “This was a groundbreaking and very successful collaboration among journalists from different/competing organizations who came together not only to share questions asked by their audiences, but also to make decisions about which outlet would answer which questions based on a collective, publicly-oriented understanding of their respective audience strengths. We weren’t sure we could pull it off, but we did, and it was amazing,” she added. That’s all for 2018! Here’s where you can find the 2016 and 2017 winners, and the full list of 2018 winners.